The annualized 1.6 pct drop in second-quarter output will put pressure on the Bank of Japan to print more money. But instead of lifting inflation and wages, monetary easing may only depreciate the yen. With a weak currency losing its power to stimulate, the gains may be limited. 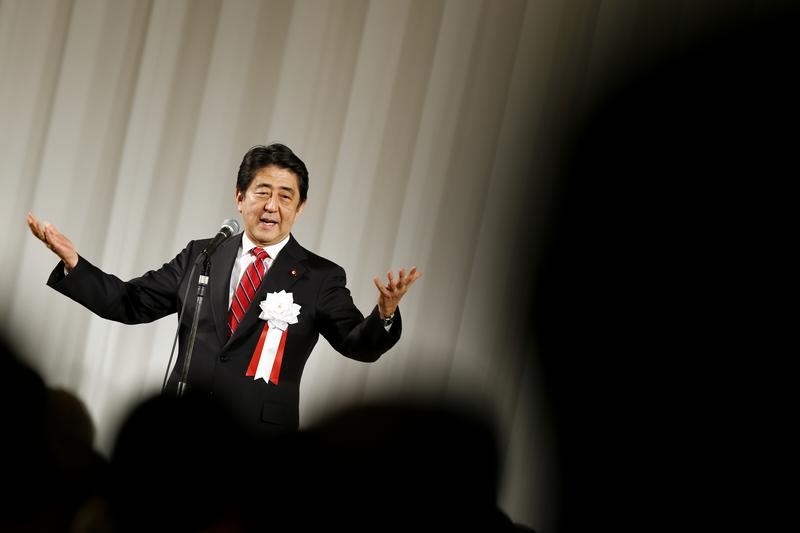 Japan's Prime Minister Shinzo Abe delivers a speech during a ceremony marking the 50th anniversary of the founding of the Komeito Party in Tokyo November 17, 2014. Reuters: Japan economy shrinks in Q2 in setback for "Abenomics"
Japan’s GDP shrank by an annualized 1.6 percent from the previous three months in the second quarter, the Cabinet Office said on Aug. 17. A 16.5 percent slump in exports of goods and services and a 3 percent slide in private consumption contributed to the decline. Economists polled by Reuters had expected GDP to fall by an annualized 1.9 percent. First-quarter GDP expanded by a revised 4.5 percent, compared with a previous estimate of 3.9 percent.